Home / MOVIE REVIEWS / "The Martian" Movie Review: Director Ridley Scott's Best Work Ever! "The Martian" Movie Review: Director Ridley Scott's Best Work Ever! When I first heard of the "The Martian" being directed by renowned science-fiction action director, Ridley Scott, I already knew this will be something big and a larger-than-life movie that I expected it to be. I am one of those followers of the director when it comes to sci-fi flicks such as "Prometheus" and "Alien" movie franchises and the epic movie re-imagining of one of the greatest stories in the Bible about Moses, "Exodus: Gods and Kings". I never doubted how great this movie was, and I'm so glad I did! What impressed me the most in this movie was Ridley Scott's love and passion for science that he always get the details straight, true, accurate, precise, and most especially, scientific! Ridley Scott's attention to details to science ideas and studies were highly commendable and likewise, entertaining. It's fun to watch sci-fi movies such as this one, my friends and I really enjoyed it! I think this is Ridley Scott's best work ever (to date). Seriously, this must be the peak of his career! But I really wish the director will not stop making, directing, and producing larger than life movies such as "The Martian". May I also add, the remarkable ensemble of cast of "The Martian" are all great, which includes Michael Peña, the not so busy actor of 2015 with Ant-Man and Vatican Tapes under his co-starring, Kristen Wiig, the it's okay if she's not included in the movie as the secretary and PR person to NASA but thankful she was included in the cast because I love her but I still imagine "Ginny" and "Sue" as she acts, Sean Ben, the first-time thank god he is not dead in this movie for a change actor who is also good in this movie, and of course, Matt Damon, that Bourne actor action superstar who proved that he can make a solo acting movie all by himself by talking to the camera while videotaping himself all at the same time, while acting, to name a few included in the movie. Overall, "The Martian" is not just all science. The movie is decent and also has action, adventure, humor, and the heart. We really enjoyed the movie, and perhaps, everyone else who did have watched the film some weeks ago. 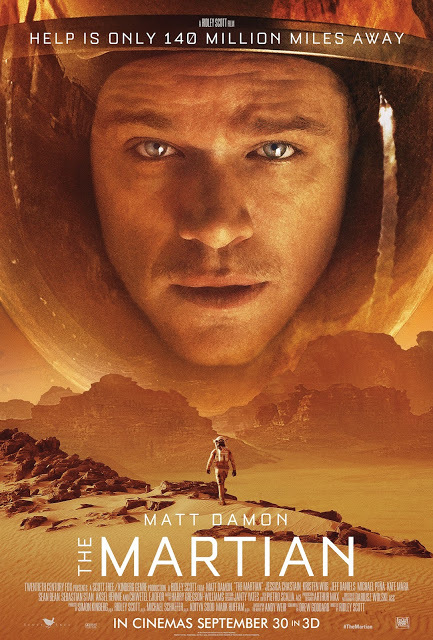 Our ratings for "The Martian" is a 9 out of 10 stars! Highly recommended for people who eat science for breakfast! I love it!